Yesterday morning I took my last run of 2010. Severe weather was threatening the area. I stayed close-by. Everything was going fine until I began my second mile. With no warning at all, my left leg collapsed, and I nearly went down. Has this happened before? Yes. But very rarely. Actually, though, it has happened often enough so that I don’t rely on my legs to serve me well in precarious situations. 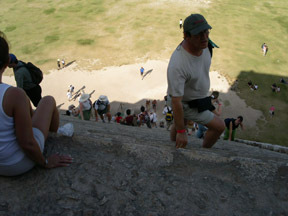 Climbing the Mayan pyramid at Chichen Itza, for example. The pyramid actually looks quite accessible from the ground. Lots of people were going up and down. After watching for a while and working up some nerve, I approached the first step. Facing me were many, many steps with no intermediate landings. A complete absence of anything to hang onto. OSHA would not have been happy. I decided I’d just start climbing and not look down until I had reached the top. The climb was very easy. A steady, deliberate pace, and I was done. Oh, what a view from up there. It was worth the climb. 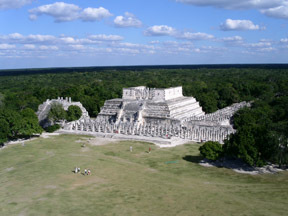 Ruins in the foreground, a blue sky with puffy clouds, Yucatan jungle stretching to the horizon. After looking around, enjoying the view, watching people huff and puff their way to the top, it was time to go back down. How was I going to do this? What looked quite benevolent from below, suddenly presented itself as a nearly vertical drop to the ground when viewed from above. Oh, boy! This was going to be tricky. One stumble and I would bounce down the stone steps all the way to the bottom. Climbers coming up in my path of descent would join me going down, felled like so many bowling pins. The odds of surviving such a fall, either alive or able-bodied, were slim. With my “trick knee,” for lack of a better description, I decided to sit down and proceed one step at a time. I was even worried about falling as I attempted to sit on the top-most step in preparation for my downward journey. Perhaps it was the ambulance sitting off to the side in the shade of a tree that focused my attention. Well, anyhow, I made it back down. 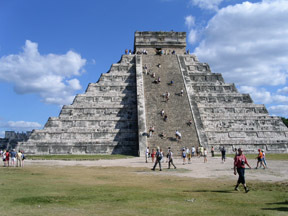 We have heard that climbers are no longer allowed on the pyramid. Unverified at this point, but understandable. All of this came to mind as I finished my last run of 2010. This entry was posted on January 1, 2011 at 5:20 pm and is filed under Running, Travel. You can follow any responses to this entry through the RSS 2.0 feed. You can leave a response, or trackback from your own site.